Happy 2018, Humble Home friends! This new year has been a whirl-wind so far! Sorry I’ve been away so long! Today I’d like to continue our home tour with the Princess Winona Room. This guest room is upstairs on the back side of our house. It overlooks the backyard, so that makes it my favorite! It is so bright and cheery, and I can watch my chickies and all the wild birds that come to the feeders that I have hanging from the beautiful pergola that my husband built on our back deck. In the spring, the pergola is covered with beautiful yellow flowers and the crepe myrtle under the bedroom window blooms bright pink. As you can probably tell, I have the worst spring fever! I am so over this winter weather, and can’t wait to get outside to work in my yard! Lets take a look at the before and after pix… Be sure not to overlook the lovely sailboat wallpaper border and the dark blue ultra thin metal mini-blinds (circa 1989) LOL!! I used my same trusty grey in this room that I used in the Napa room. It is called Platinum Grey by Benjamin Moore. Like I’ve said before, it is a true medium grey, meaning that is stays grey in every light. If you’ve ever worked with greys, you know the struggle to find a grey that ALWAYS looks grey is very real! Arrrrgh! I highly recommend this one! It’s the one on the bottom left. No let’s break this room down… I’ll tell you where you can find this stuff, and how little it will cost you! Yay! Let’s work from left to right. The framed vintage pictures on the largest wall (on the left) are from Homegoods. I actually just picked them up yesterday! they were only $40 each. The nightstands are from Pier One’s Hayworth Collection. I got mine about 10 years ago, and they don’t carry this exact one anymore. But they do carry this smaller version, and this slightly different version. Most of the little trinkets decorating the nightstands came from At Home. 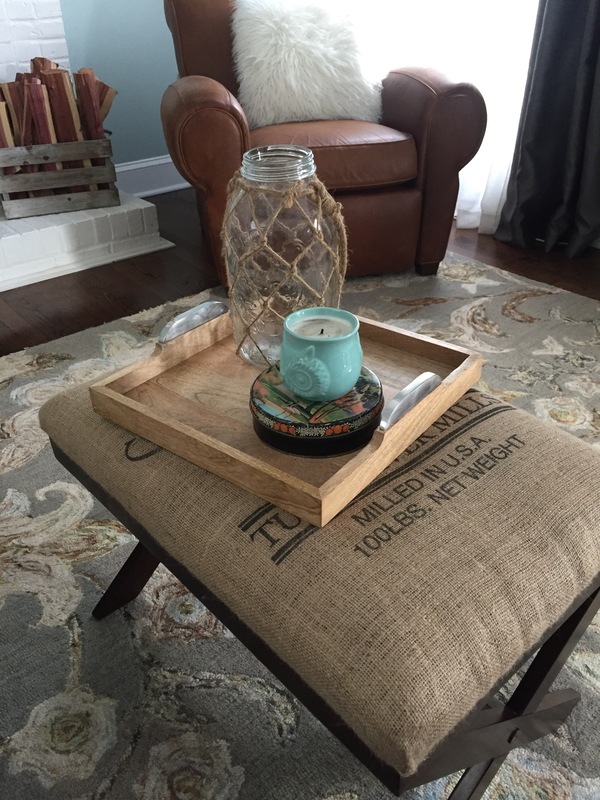 The lamps are from Homegoods, the shades are from Lowes, and the awesome vintage thermometer came from one of my favorite antique stores in Waxhaw called Waxhaw Antique Mart. My beautiful tufted headboard was a steal! 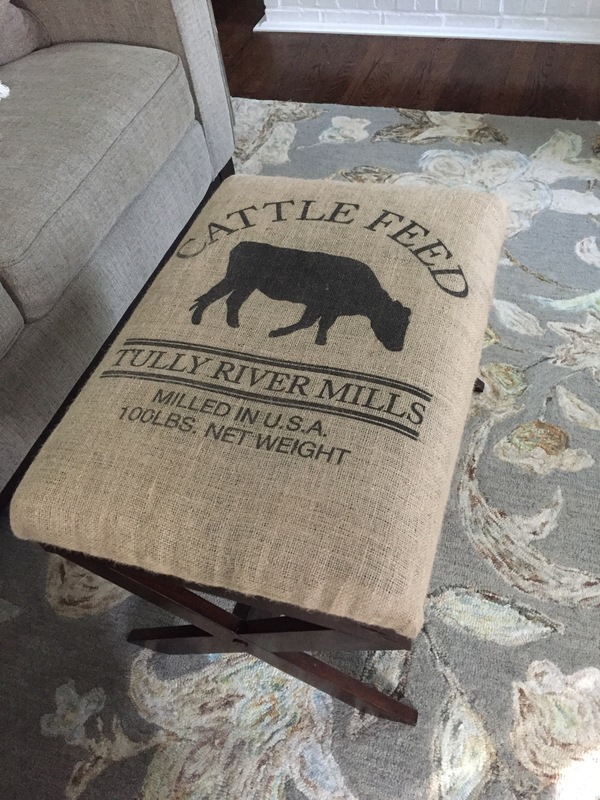 I got mine from Wayfair for about $100, but their inventory comes and goes like Homegoods. However, I did find the exact same one on Baxton Studios for only about $30 more. You can also find it on Hayneedle and at Target.com and on lots of other websites. It’s a pretty common one. The canvas above the bed is also from Homegoods. I think it was about $30 and I got it yesterday as well. All the throw pillows and the bedding came from At Home. The bedding is king size and it was about $50 for the set of two pillow shams and the quilt. 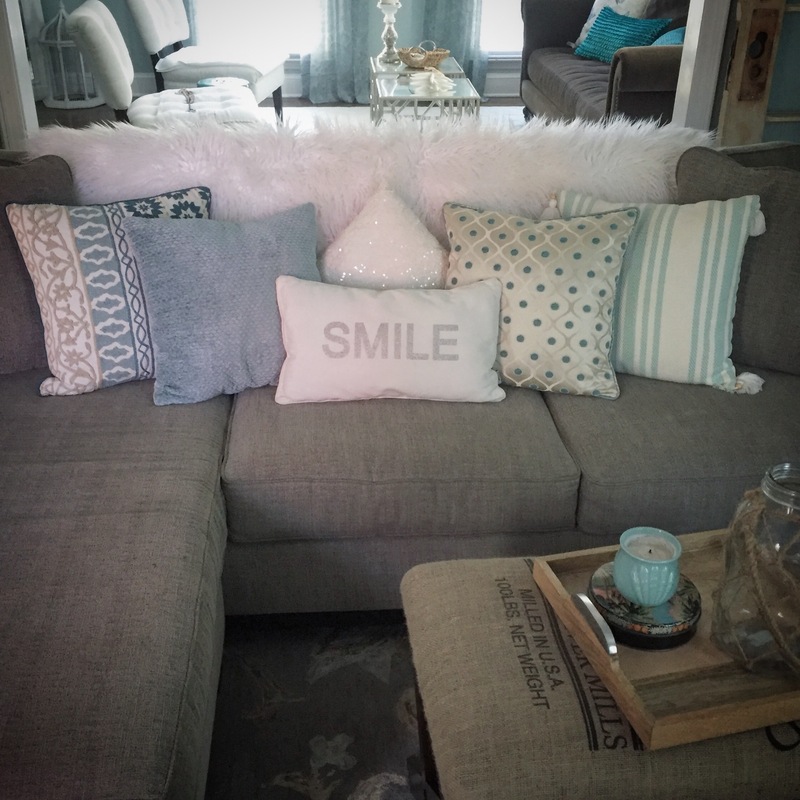 The throw pillows ranged from about $15 to $20 a piece. The white fur pillow, and the white fur throw blanket at the foot of the bed came from Homegoods. The blanket was $50 and the pillow was about $30. The bench at the foot of the bed is from Hayneedle. It was on special for $250. The floral window panes on the other wall are from Homegoods. They were $19 a piece, buuuuuuut I got them so long ago, I can’t imagine there’s any way to find them again at this point. My window sheers are one of my favorite things in the room. 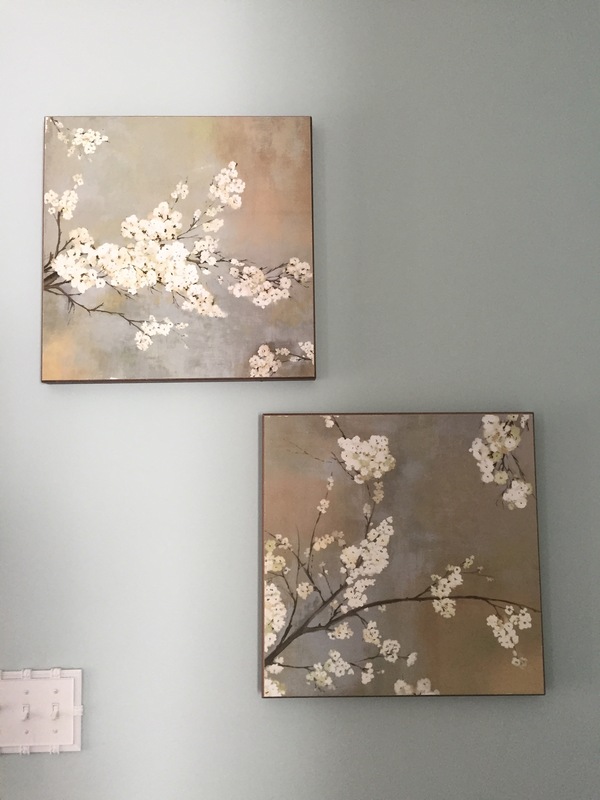 They are from Bed Bath and Beyond, and they were a bit of a splurge at $50 per panel! Yikes, that is so unlike me, but I just had to have them! I wanted to keep the bright and airy feel of the room, and everything else I looked at just seemed to weigh the room down. Now this dresser!! It is old and I love it! I found it at a custom antique furniture refinishing shop in Waxhaw. The shop is called Funki Munki. They don’t have a website, but here is there facebook page. You have to check them out, and please tell them I sent you! 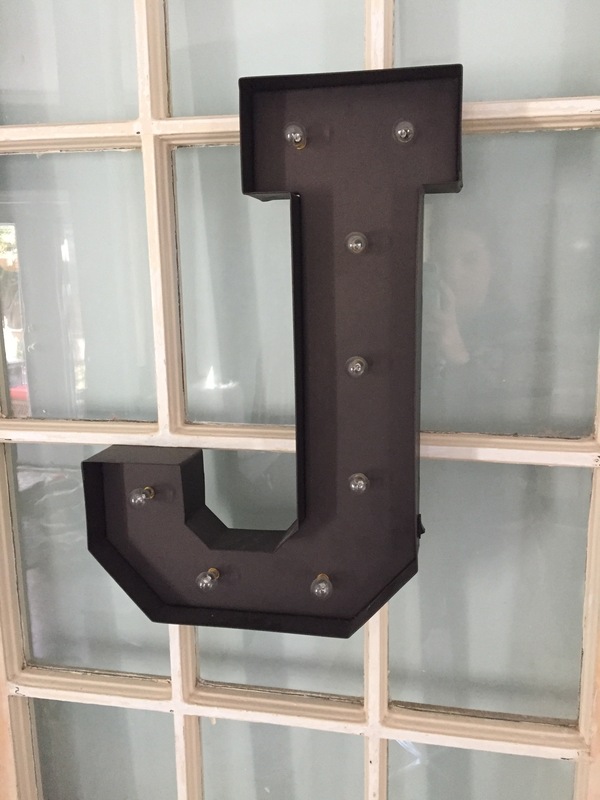 It is owned by a local mother and daughter team, who paint and refinish each piece personally! I got to pick my color and tell them how I wanted it distressed and how I wanted to hardware restored and everything. It only took them about a week to complete my piece, and boy was it worth it! I’m in love! Hi Guys! Welcome back. Today we’re going to tour the “Napa Room”. I have names for our guest rooms so we can keep them straight 😉 This guest room is on the front side of our house and overlooks the cul de sac and our front yard. Our house faces east/west, so this room gets morning sun, which is a cheery way to wake up. My husband and I don’t share a closet (one very important key to a successful marriage, haha!) so his clothes live in this room, which means this room gets a lot of use. I know everyone loves a before and after comparison, so here you go… Gotta love that lighthouse wallpaper border, right! Lol! And please don’t overlook the ultra thin metal mini blinds! After a lot of trial and error with my shades of grey (ie: lavender, blue, khaki, etc…) I have finally found my winner! It is a Benjamin Moore color called “Platinum Grey“. It is on the bottom left in the swatch card below. It is a medium intensity (meaning not too light, but not too dark) true grey. It ALWAYS looks grey, on every wall, in every type of light, ALL the time! If you have never worked with grey, then you may not understand what an extraordinary feat this actually is! Grey is such a frustrating, but rewarding color to work with. I used this color on the walls in this room and several others in our home. 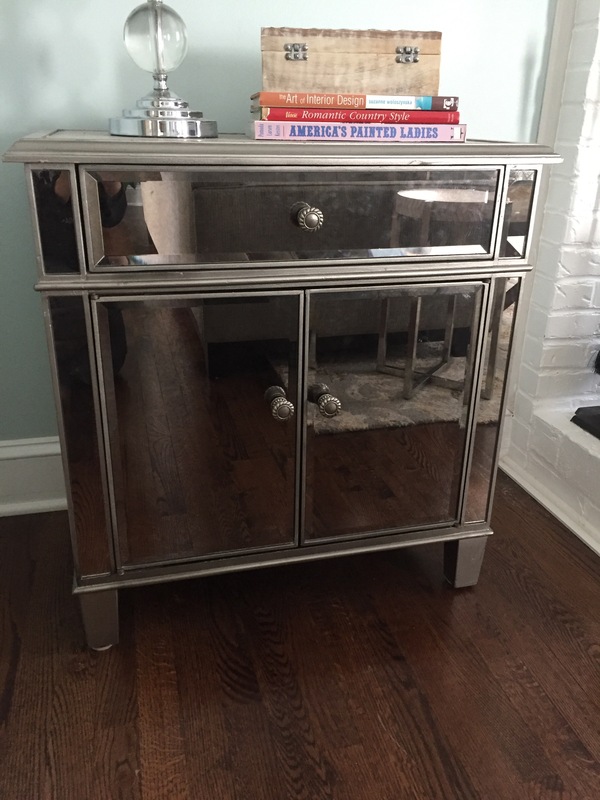 The dresser and nightstand in this room are from the Shanghai Collection by Pier One. I LOVE this collection. I have to admit that I have actually purchased this collection THREE times for different projects I have worked on! The only complaint I have is that they scratch easily, so I covered the top surface with silk placemats (also from Pier One) before I set anything on top that may cause a scratch. The headboard is one of our creations. We made it out of an old bamboo window shade and some baseboard moulding. I stained the moulding to match the dresser and nightstands. 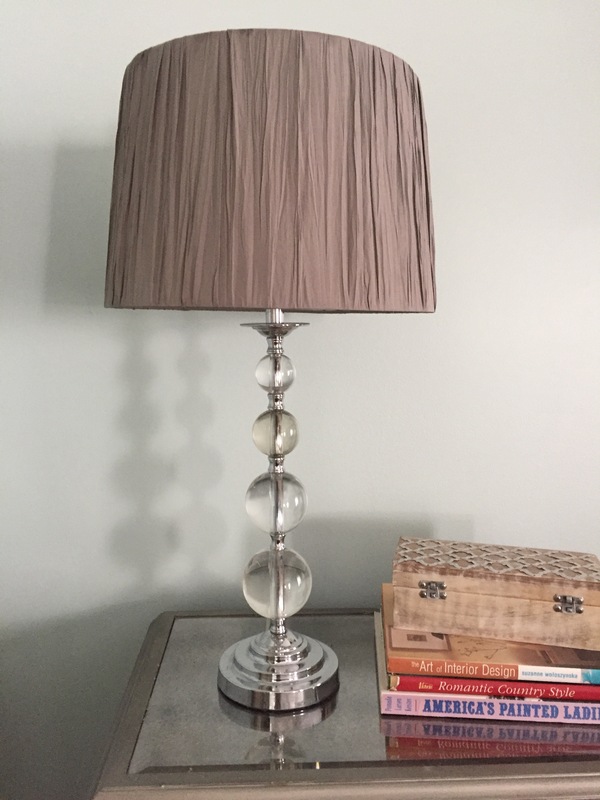 The lamps on the nightstands were a makeover project. I picked them up at Goodwill on Pineville-Matthews Rd., then cleaned them up and hit them with a fresh coat a spray paint to match the hardware on the dresser and nightstands. You can find the step by step instructions for that project here. The throw pillows, curtains, and blue blanket at the foot of the bed came from Target. 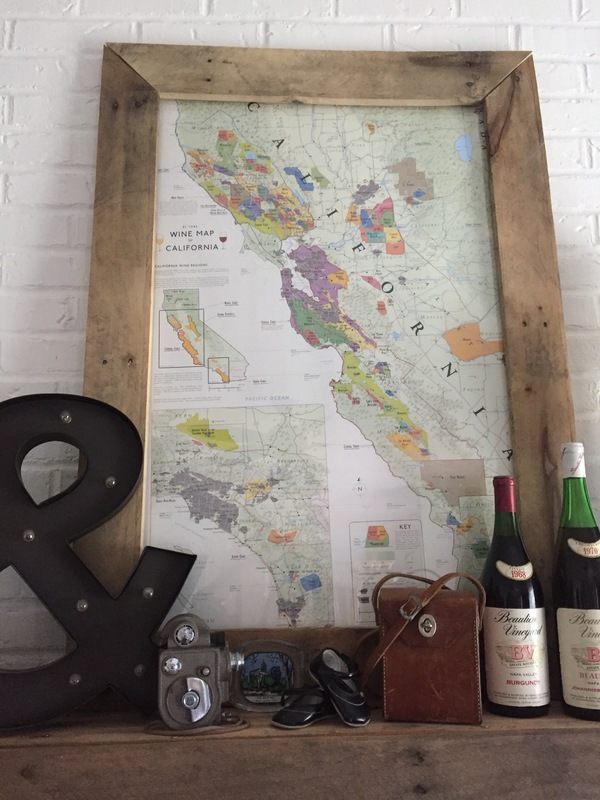 The framed paintings of the Napa Valley between the windows are a gift from my mom. She had them hanging in her home forever, and I have always loved them, so she passed them on to me. There is a larger painting that matches, but it is too big to ship across the country, so I purchased a new framed print from FramedArt.com to go above the bed. It’s not nearly as nice as her set, but it is the best I could find. It hasnt arrived yet, so I’ll update y’all when I actually get to lay eyes on it. The bronze wall clock and mirror actually belonged to my husband in his bachelor days, so that worked out great! Good thing he has good taste! And last but not least, these cute little hanging lamps were a HomeGoods find. 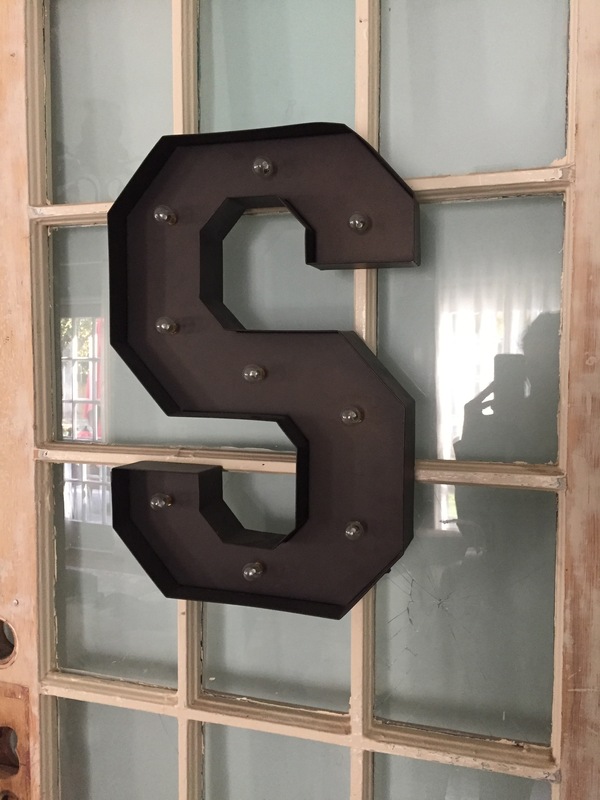 They were chrome when I bought them, but I spray painted them a coppery color so they would match the room better. Hi, guys! Welcome back! Today we’re gonna tour our Family Room. 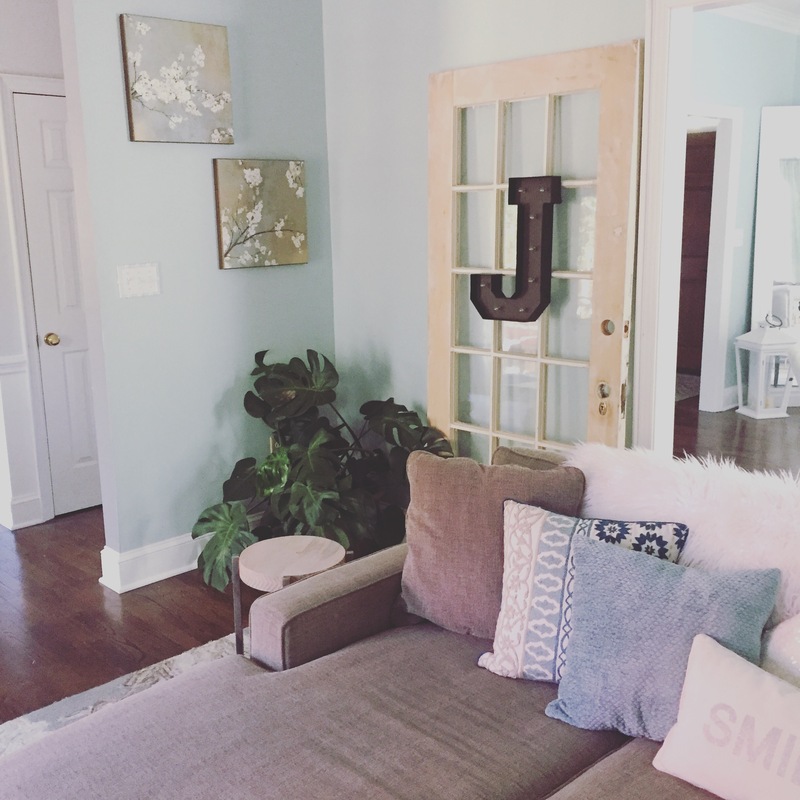 This is the room where we spend most of our time (and where my husband spills juice on the rug and spaghetti sauce on the couch), so it’s definitely a lot more casual and cozy than our Formal Living Room. I continued the same wall color from the living room into the family room because I wanted the rooms to flow together as much as possible, given the fact that there is a wall with a cased opening separating them. Side note… We live in a traditional American four square. There are a lot of them in this part of the country. It is a two story, square shaped house. The main floor is divided evenly into four squares (hence the name). The front two squares are usually the formal living room and the formal dining room. The back two squares are usually the family room and the kitchen. There is almost always a foyer with a staircase right in the middle when you step inside the front door. The bedrooms and full bathrooms are upstairs. There is also usually an attic or “bonus room”. It is definitely not the open floor plan that is so popular today! But we work with what we’ve got, right?! 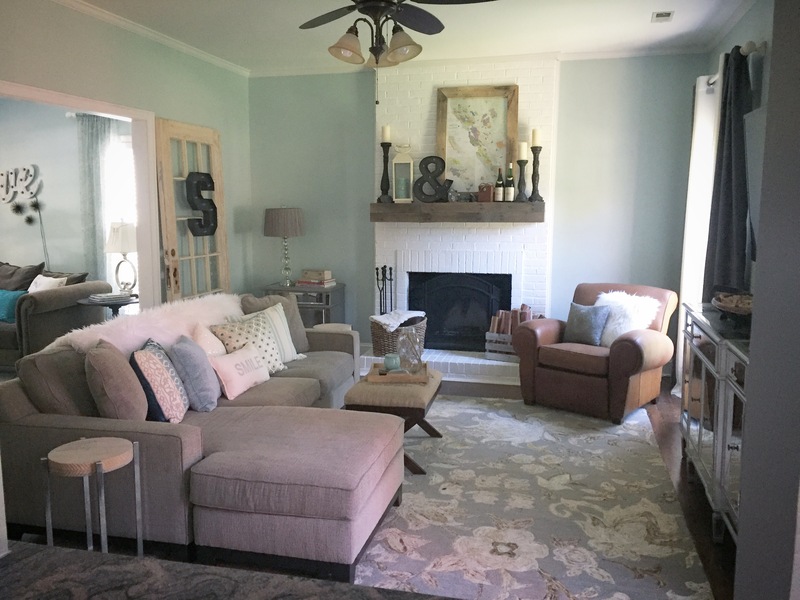 Unlike in the Formal Living Room where I stuck with crisp blues, grays, whites and pops of bright teal (all in the cool blue, gray and white spectrum), I worked a lot of different textures and warmer earth tones into our Family Room. Warmer colors and richer textures create a cozy, multi-dimensional environment. In other words, it is a warm cozy room where you would want to curl up on the couch and relax. 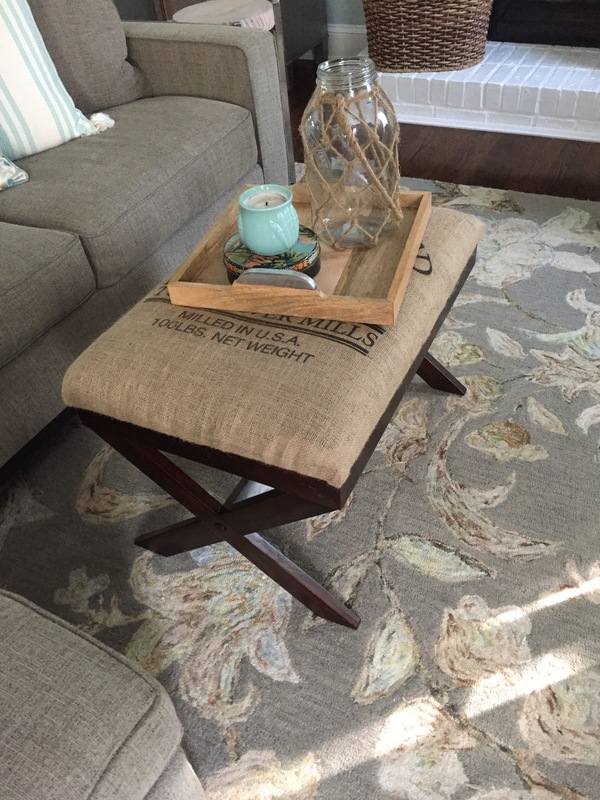 Now… bringing warm browns and rusts into a cool blue and gray color scheme is no easy feat! The trick is to find one key piece to tie it all together. 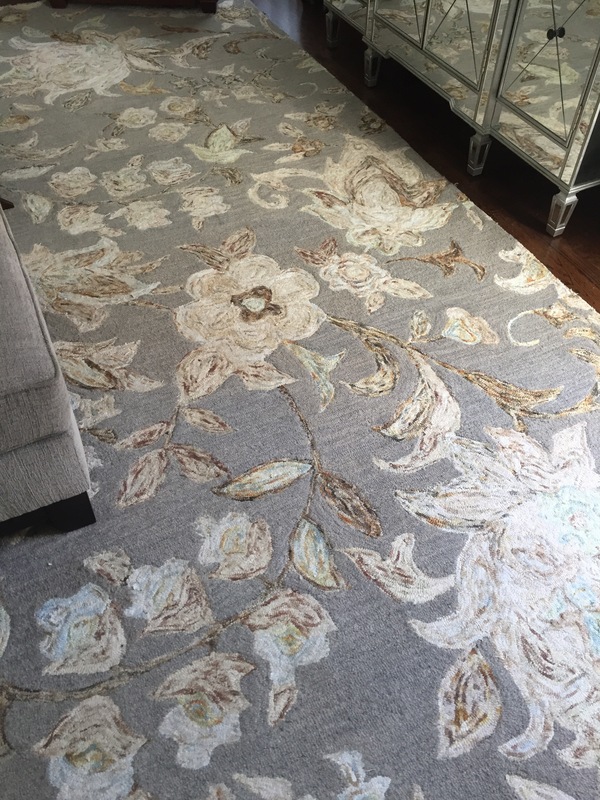 It can be a piece of wall art, a set of curtain panels, a piece of upholstered furniture, or in our case, an awesome area rug! We really got lucky when we stumbled upon this beauty at HomeGoods! The main color is gray with an irregular floral pattern of cool blues, white, rust, brown and yellow. Woohoo!! Now we have license to use any or even ALL of these colors together in this room!! 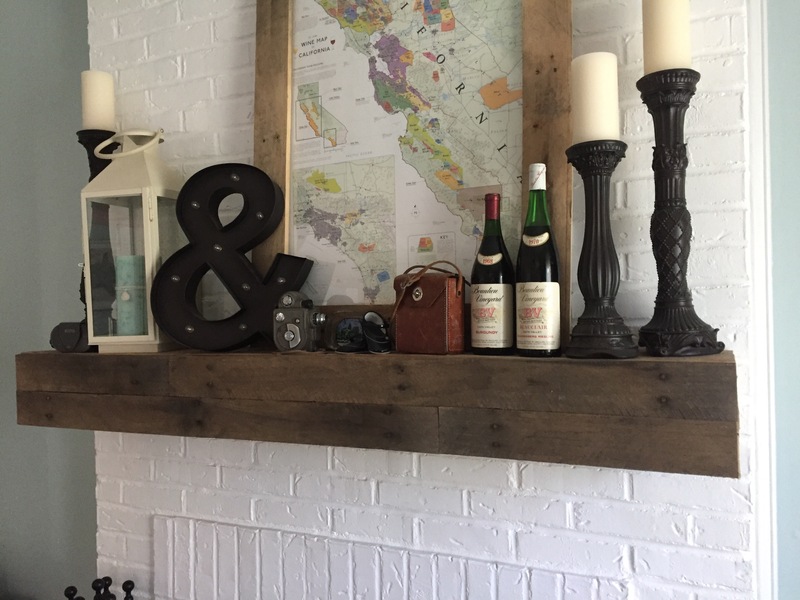 We started by painting our red brick fireplace white, then we added wood, lots and lots of rustic reclaimed wood! 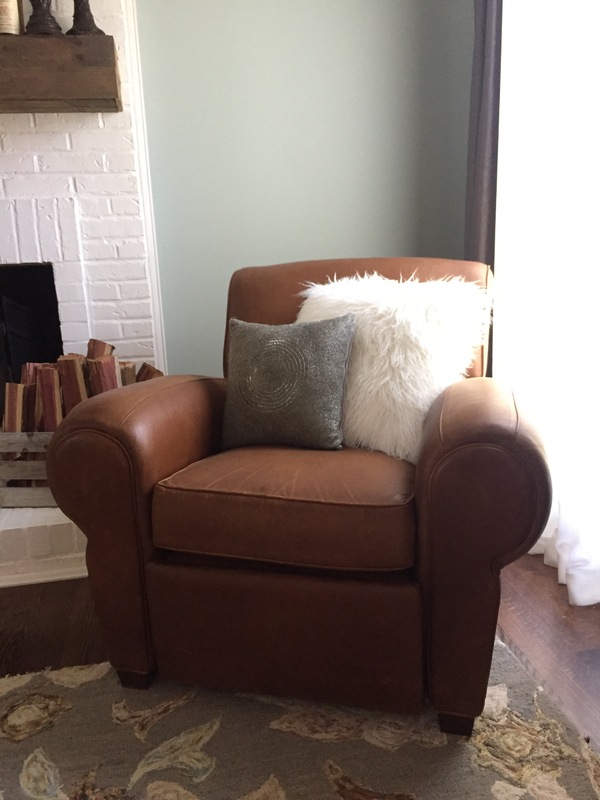 Next, we added a rusty cognac leather recliner from Pottery Barn (The Manhattan Leather Recliner $2,000). 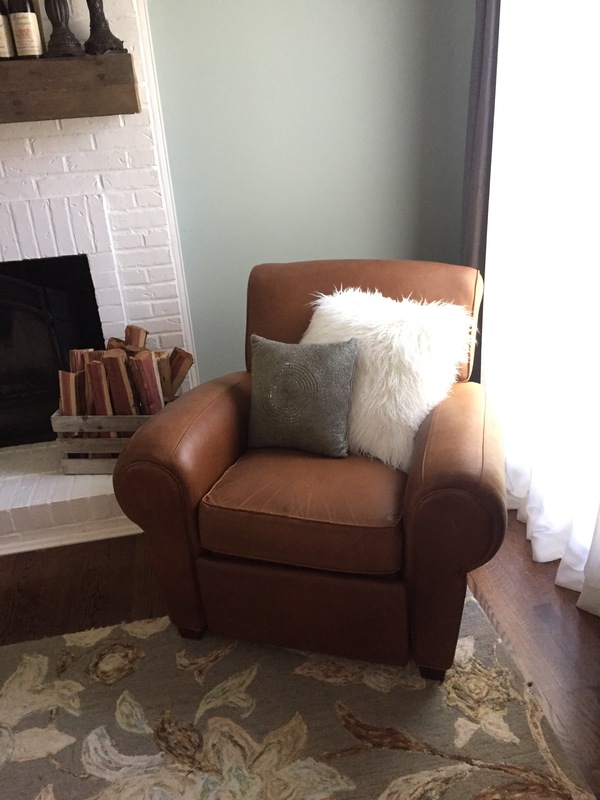 Nothing says warm and cozy like leather and wood! 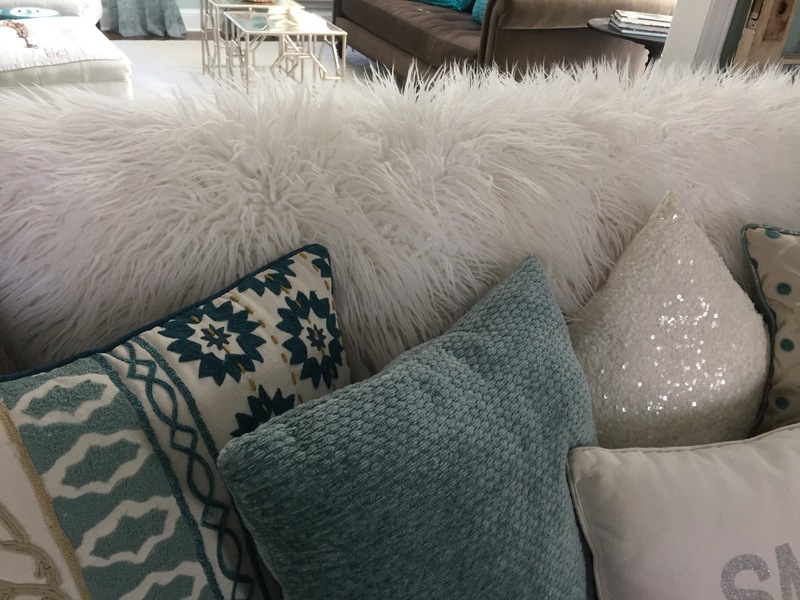 For added texture, I used dark gray silk drapery panels layered with gauzy ivory sheers, a heavy faux fur throw, burlap covered ottomans and lots of throw pillows. 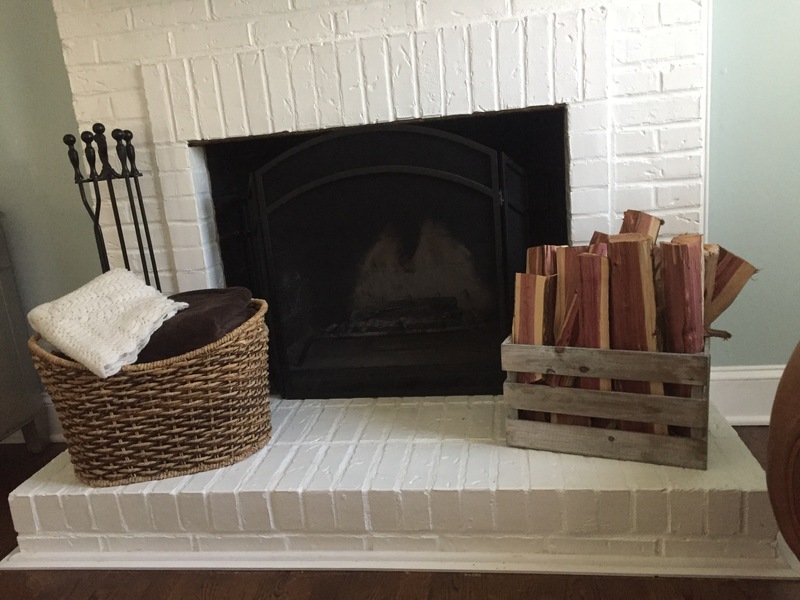 To make it even cozier, we set a natural weave basket full of blankets and a wooden crate of firewood on the fireplace hearth. 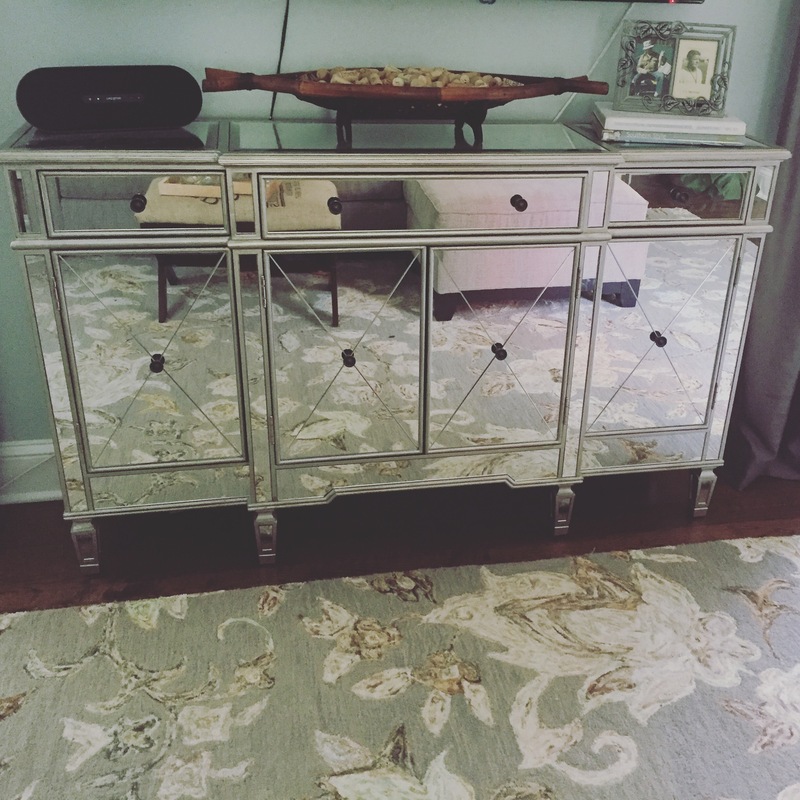 But even though this is a cozy room, we don’t want to lose our classy eclectic edge, so I incorporated my mirrored console table and chest into the room. You always want to carry a few common elements from room to room, just to tie the whole house together. 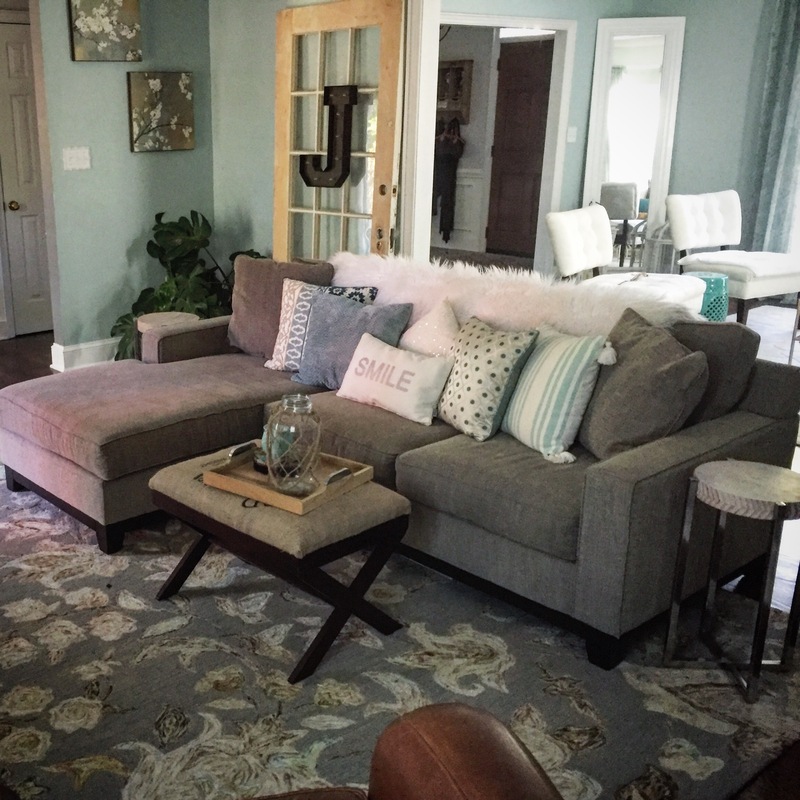 In our case, we carried the robin’s egg color on the walls and in the accents throughout both rooms; the dark grey couch in the Formal Living Room is the same color as the dark grey curtains in the Family Room; and both rooms have formal mirrored pieces. Let me know if you see anything I forgot to mention! If you have any questions or comments, please don’t hesitate to leave me a comment or message me! I hope you are enjoying the tour so far! And, as always, thanks you so much for reading! Hi, Friends! Welcome to our home! I hope everyone is having an awesome weekend! We’re really enjoying this fall weather. My husband and I ride a Harley, Road King. Fall is the best time to ride, so we have been out a lot lately! There are a few little old towns around Charlotte that have done such a beautiful job preserving their historic “main streets”. It warms my heart to see people so invested in maintaining the integrity of these beautiful old homes and commercial buildings. They don’t build them like they used to, guys. If we don’t learn to appreciate and maintain these historic buildings, one day they will all be gone! We spent Saturday afternoon in downtown Waxhaw. A new brewery just opened up in the old firehouse building called Dream Catcher Brewery. We really enjoyed it! If you’re local to the area, you must check it out! I know its hard to trust your computer/phone screen, so I’ll describe the color as a soothing Robin’s Egg blue with a hint of gray. For those of you who may be a little less color savvy, “Robin’s Egg” is a lighter blue with a slight hint of green. Adding the hint of green warms and softens the blue, which may otherwise be a bit cold and sterile; and adding the hint of gray keeps the color from “glowing” in the natural light and becoming overwhelming. Just about any color can be toned down by adding a bit of gray. You can find Behr’s paint line at Home Depot. As for the furnishings, I found my couch at Z Gallerie. I LOVE Z Gallerie!!! I bought this couch about five years ago, so they no longer carry this exact model, but the Wakefield Sofa is very similar. If you like mine, you will like this one too! 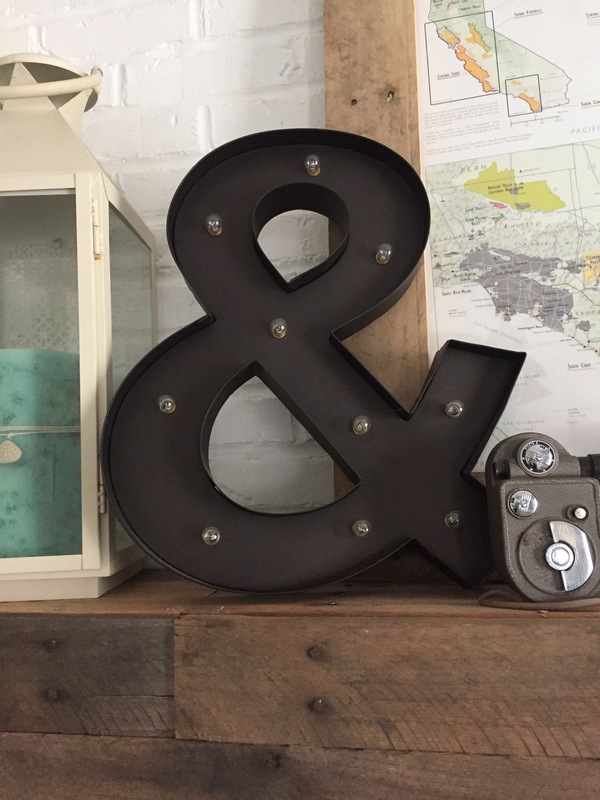 Actually, it’s hard not to love everything Z Gallerie has to offer because they are amazing! I found my white chairs on amazon, but they have quite a history! When I found them on extreme clearance, they were a hideous red fake leather! I bought them because they were super cheap, I mean who in their right mind would want fake red leather slipper chairs?!?! I knew that I wanted pink velvet slipper chairs because I had seen a picture of a room in House Beautiful Magazine that I had been drooling over for months, and in that inspiration room, there were two gorgeous pink velvet slipper chairs! One way or another, I had to have those chairs! So I bought the ugly, cheap red chairs, and immediately had them reupholstered in luxurious soft pink velvet! I was in LOVE! But then I actually fell in love… with a MAN! A man who I simply could not force to live in my pink velvet, satin zebra print living room that girly dreams are made of! So the lovely pink velvet slipper chairs became white linen slipper chairs, which I’m not sure was a good choice either since men are dirty and gross! Haha! My husband is still kinda confused about these chairs that are really decorations that he’s not really allowed to sit on. Men will never fully understand, right?? Moving on, let’s talk about the tables… There are a lot of them in this room! 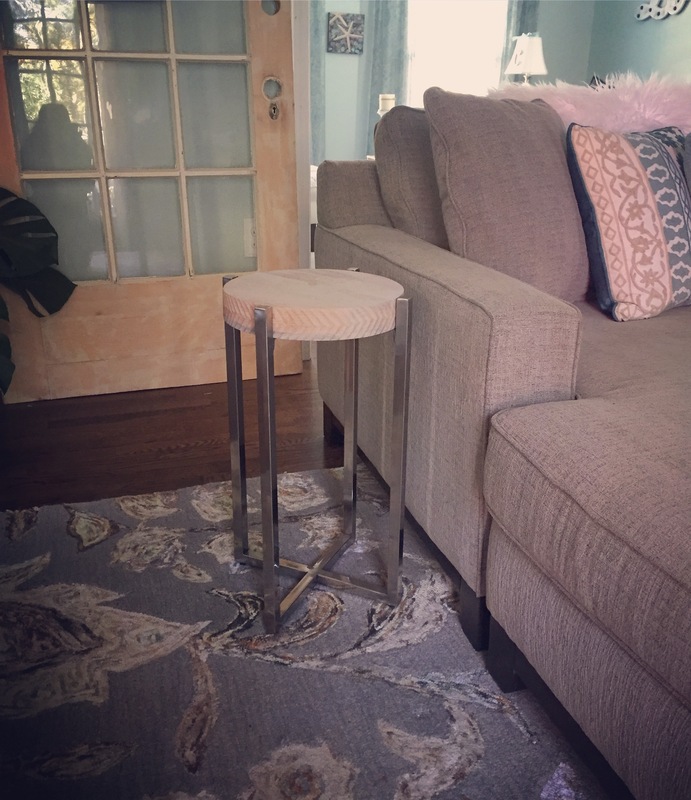 I found the teal ceramic garden stool on Walmart.com! Even if you are not a Walmart shopper, give Walmart.com a whirl. You will be amazed by what you find! The champagne colored, faux bamboo mirrored table set is from Wayfair. I’m online shopping junkie! I admit it! When I bought them, they were silver. I hit them with a light coat of Caramel Latte spray paint by Krylon because the rest of the room was more champagne and less silver. The metal mirrored table to the left of the sofa is from HomeGoods. It was $29. I searched for a matching one for about a year before I finally gave up and settled for the round table on the right end of the sofa. My husband works for a senior living company, and that table was left behind by a resident, so the company told him to get rid of it (which always means bring it home), so there it sits. It’s grown on me at this point, so it can stay until I find something I like better. The sheers are from JC Penny. They were on clearance for about $10 per panel! Score! I’ll let you in on a secret… JC Penny has the best selection of curtains! Random, I know! But it’s true! They actually have a whole department specializing in custom drapery! Mind Blown! The framed artwork with the shells is also from Z Gallerie. It is currently in stock. The marquee “Love” sign, two small shell canvases, the table lamps, all the throw pillows (except the furry ones), and all the table decor is from HomeGoods. Inventory changes constantly, so you will have to stop by your local store to check out their current inventory. The little sea urchin looking things, the aqua colored owl candle, and the faux fur pillows are from Target and I believe they are all still in stock. I bought them within the past year. 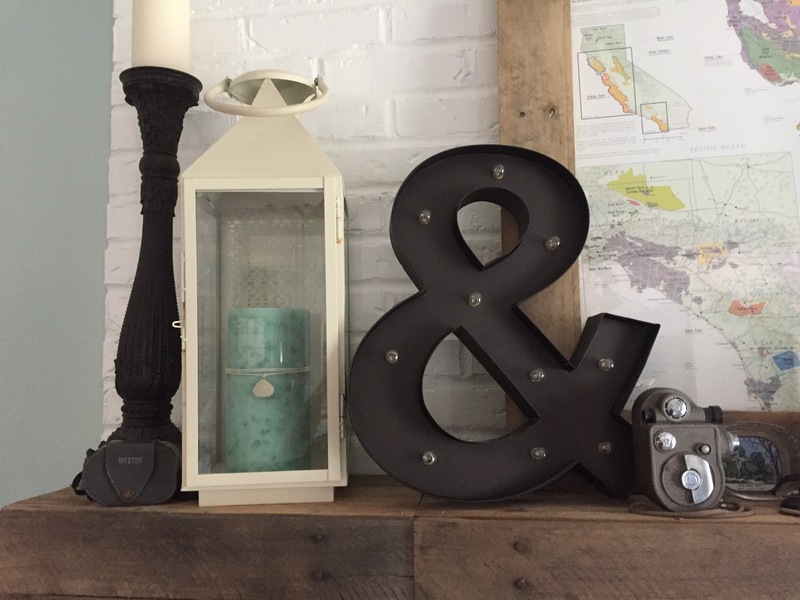 The Wooden lanterns are from Pottery Barn. Mine are several years old, but these are currently in stock. The Large bird cage is from Pier 1. I got it a very long time ago, but I found this one on OverStock.com and it seems quite similar. If you like mine, you might want to check it out. I made the curtain rods. 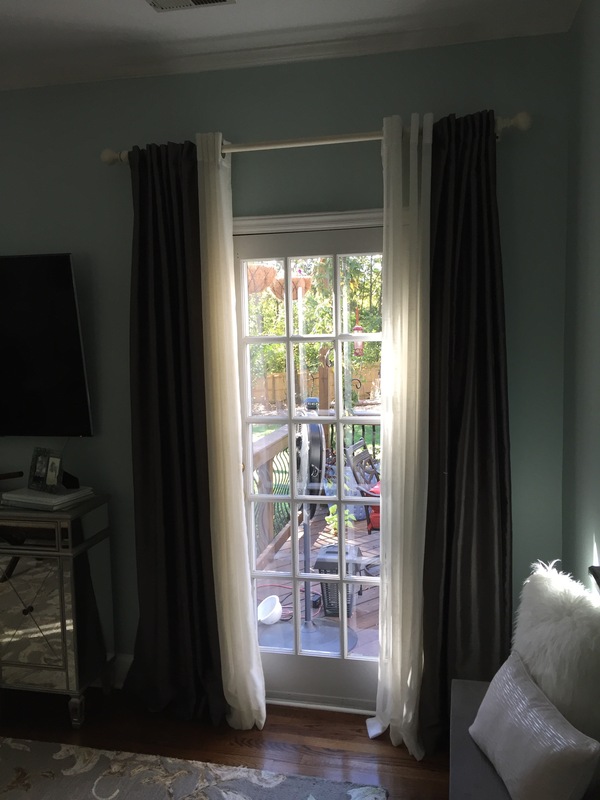 If you’d like to learn how, please see “DIY Curtain Rods for Just Pennies a Foot!” posted on September 14th for step by step instructions. If you happen to see something that I’ve missed, please let me know! Just leave a comment or shoot me a message! You know I always love to hear from you!! Thank you again for stopping by! I’m so excited to share my home with you!